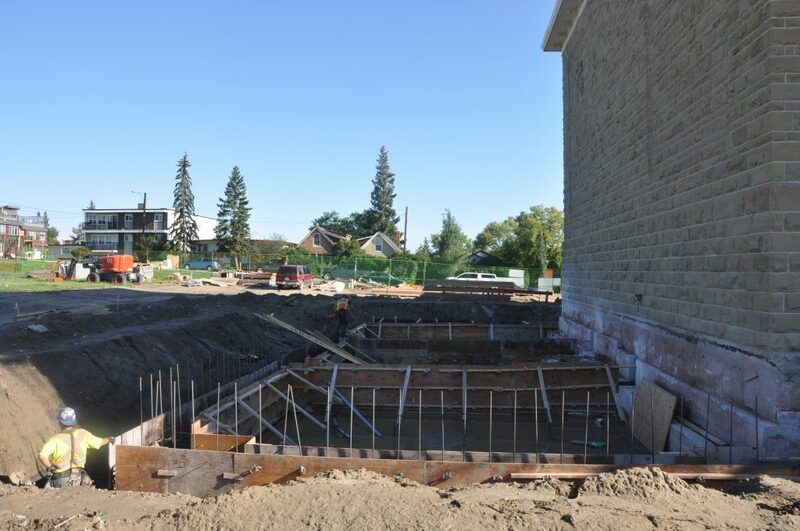 It’s been quite a while since our last construction update! We’ve been pretty busy all through the fall and winter. The last 6 months blew by at a breakneck pace as we readied to welcome the tenants of cSPACE King Edward home in time for the new year. From the hustle and bustle of construction activity to a vibrant hub of art, community and innovation; it’s hard to believe that our muddy, hard hat construction site, is now also bustling with the activity of the artists, organizations and visitors we’ve been waiting for. But the work isn’t done yet! Construction continues on the new west wing (opening fall 2017) and from time to time we may have to ask that you pardon a little dust, noise and construction activity. 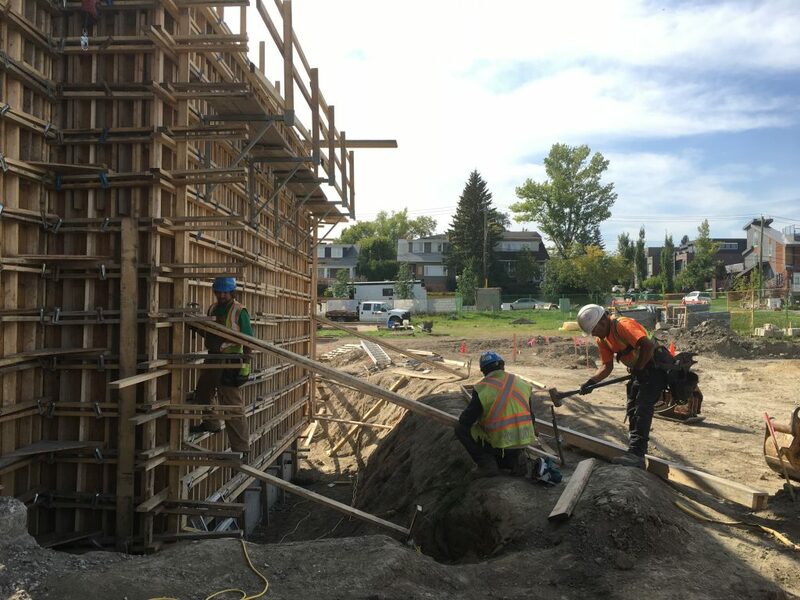 For now, let’s take a look back at some details of King Edward’s revitalization over the past 6 months – like reconstructing historic bricks to erecting new steel construction, pouring concrete and more. 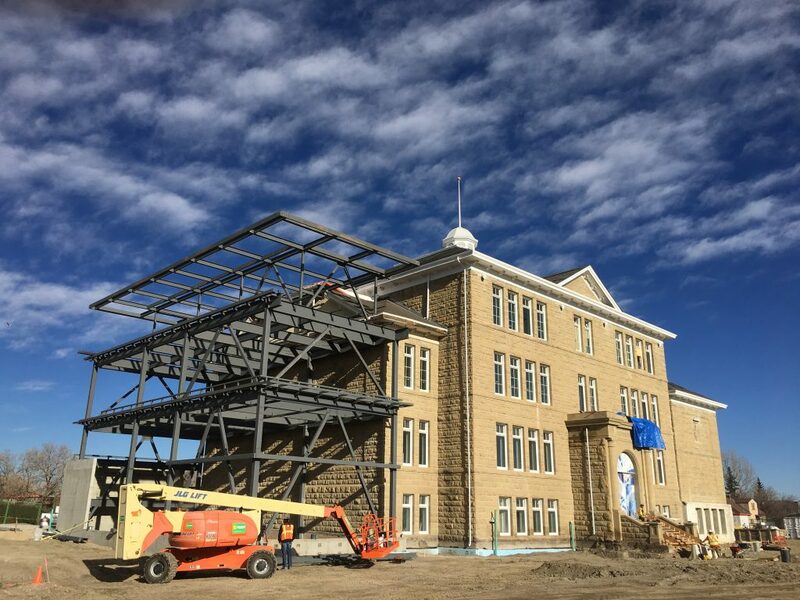 Of monumental consequence this Fall has been our initiation of construction on the new west wing – a contemporary addition that will remake the “wholeness” of the historic school that had been dismantled in the late 1970s. 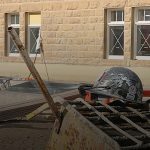 Our first step following demolition of the historic foundations came with new footings totalling 75 cubic meters of concrete in August. The concrete enclosure for the north end of the space was also erected signalling the new technical booth of our studio theatre. Assembled over the course of only a few weeks, one can now more easily imagine how the architecture language of new and old will merge and re-complete this historic structure that has undergone a century of change. 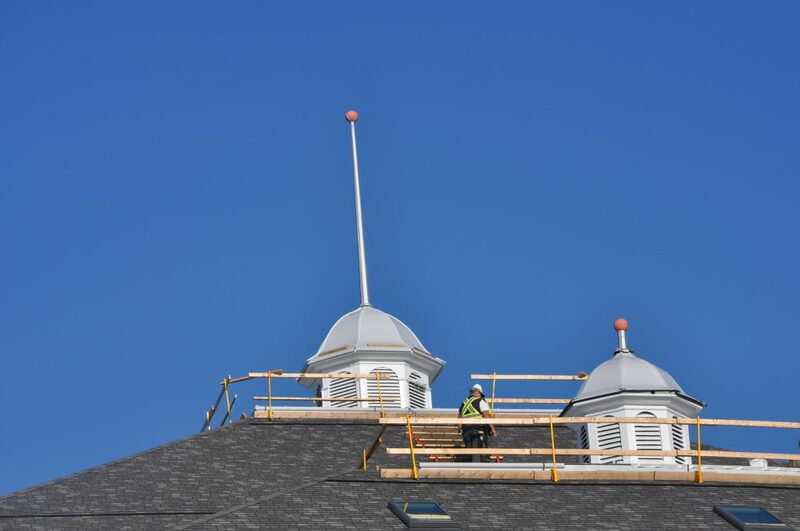 We’re looking forward to when we can remove portions of the old roof, allowing this new structure to connect back with the historic school later in February. 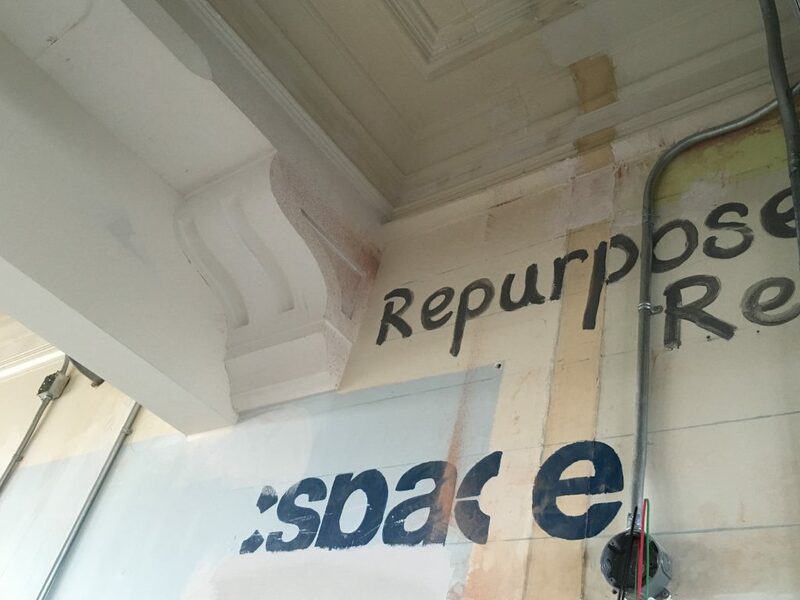 This will be another exciting moment for the project as access through sandstone walls will be created to access our studio theatre, cowork shared office space, and 4th floor meeting and amenity spaces for tenants. 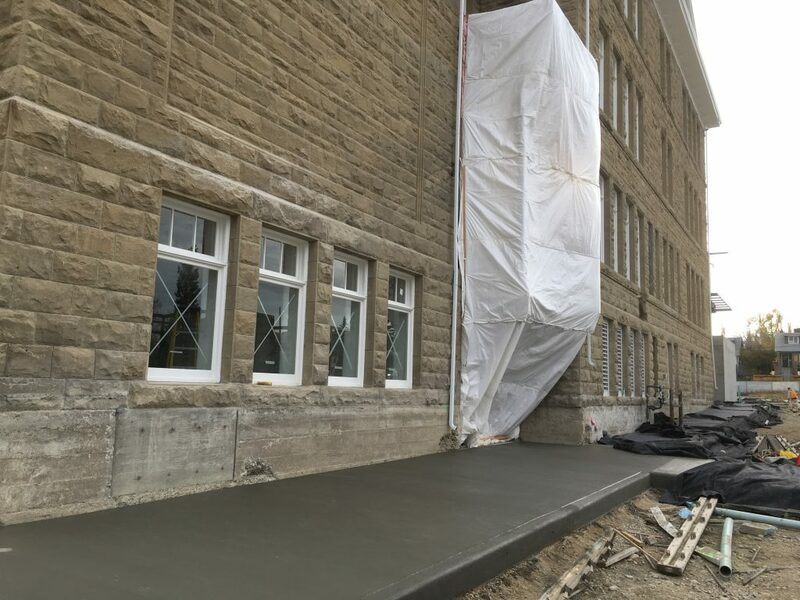 On the exterior of the building, work continued with sandstone repair, site grading and concrete work, and steel structure for our service enclosure. Up on the roof, new shingles and attic studio skylights have been completed and the historic soffit details have now been rehabilitated. 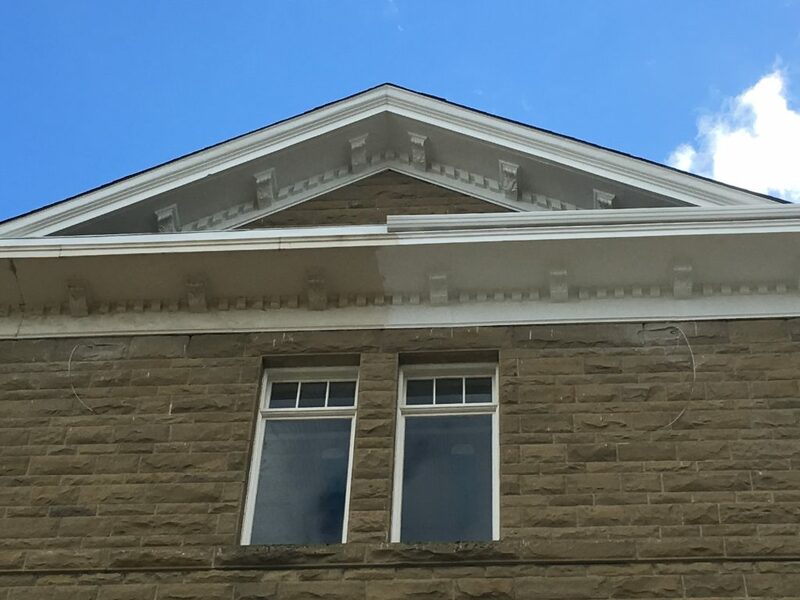 With a fresh coat of paint and new eaves trough, it’s clear to see these improvements are for a building cared for and that will help it function well for many more years to come. 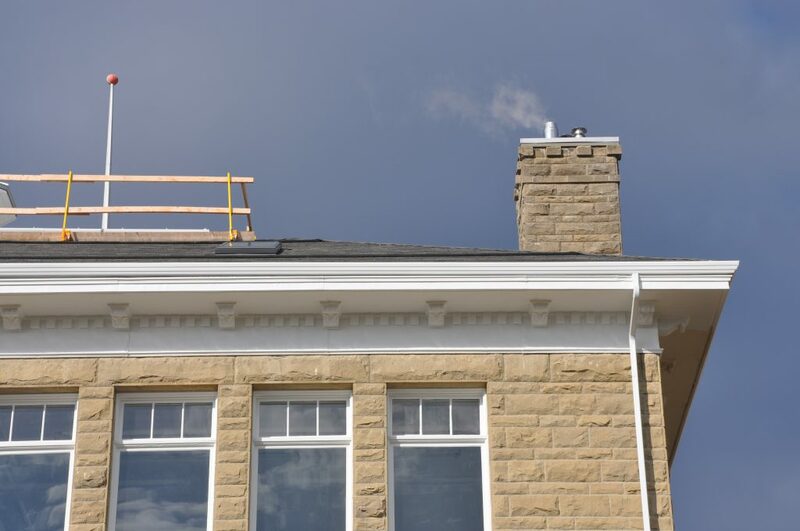 Also up on the roof, the historic chimney was carefully documented and dismantled, has now been reconstructed in its new location. Our north service enclosure steel has now been fully erected and air-conditioning unit has been installed ready for mechanical connection to the main building. Concrete curbs were added around the perimeter of our parking areas and grading began in preparation of laying gravel and asphalt ahead. 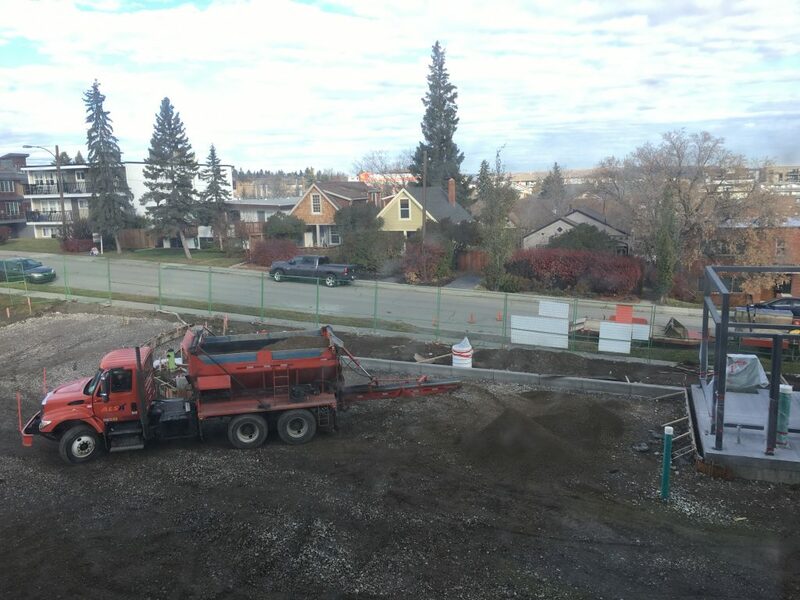 And as October finished up, we are pleased that our north sidewalk has been poured signalling that our site will be a much less muddy going forward! 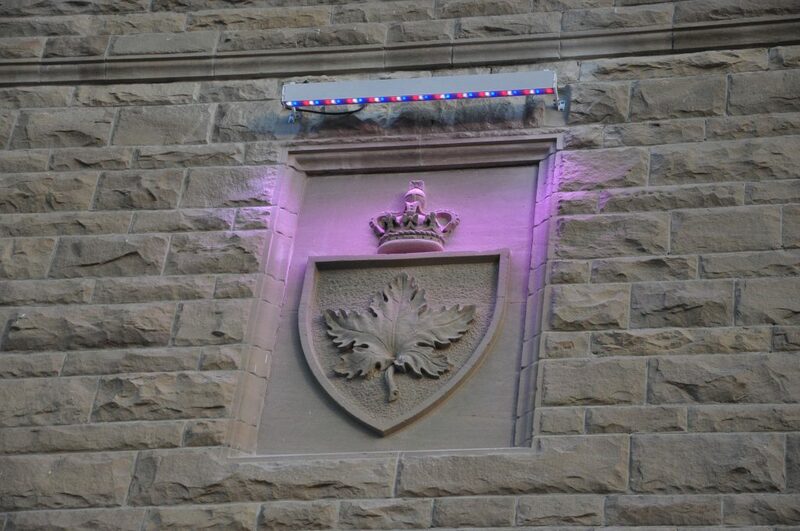 We also installed the LED lighting above the historic crests and have been enjoying how beautifully illuminated they are at night. And the south entrance has also been restored back to their former glory, with the demolition of the 60s inspired painted infill hoarding that was up and the pouring of new concrete stairs. 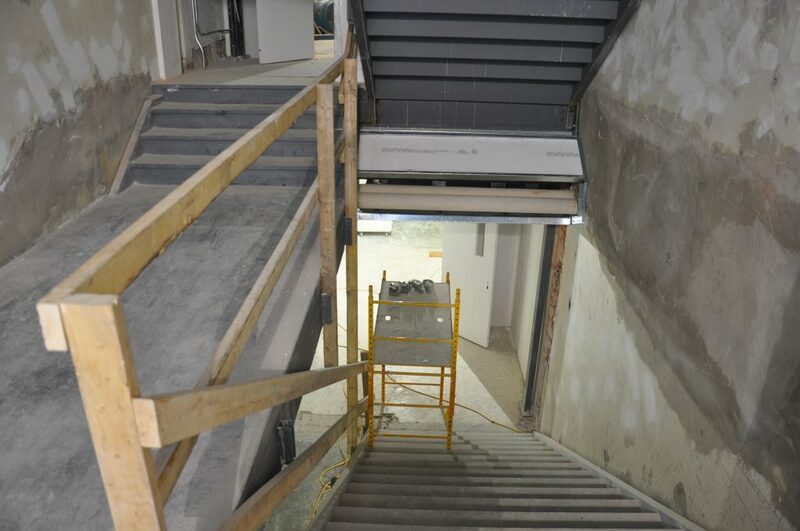 Since our last blog the new north entrance stair has advanced in leaps and bounds. 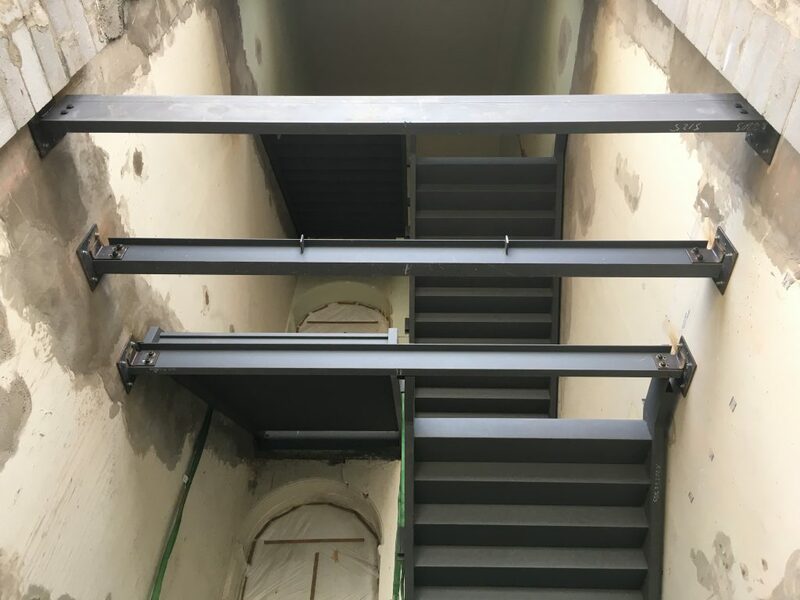 First the steel columns and stringers, platforms and threads for our new concrete stairs were installed. Then steelwork began on the new facade portions of this entrance, signalling how contemporary architecture will be sutured between the historic fabric of brick and sandstone. 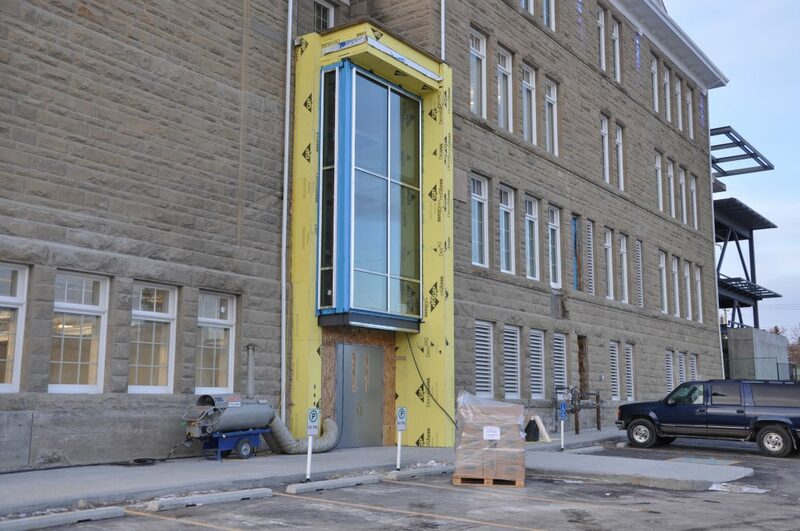 Once this structure was in place, concrete was poured towards the end of October to make the floors of the stairs accessible. 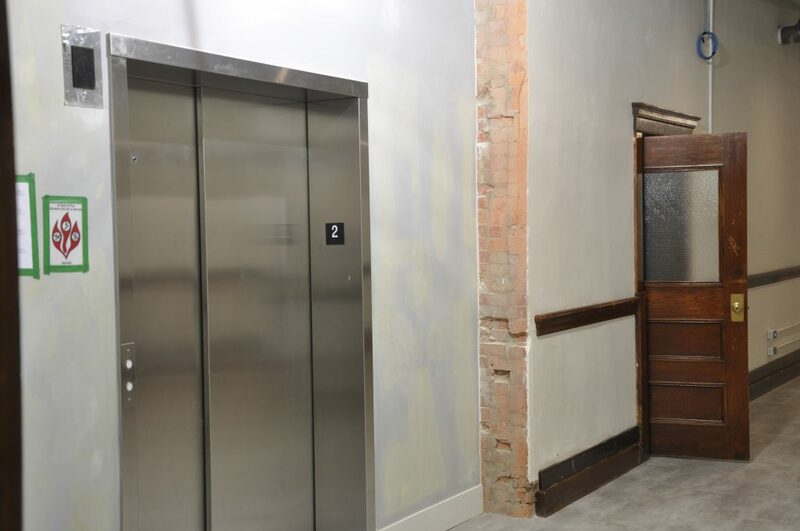 Ample landings, three stories of glazing and impressive views of the downtown core, the stairwell will also provide passersby a peak into the creative facility and act as an exciting landmark. We look forward to sharing our chosen artists later in the year too – whose artwork will enliven this space and our other two public art sites for years to come. On the inside, what was once a tired old school has now clearly transitioned into a new state of becoming something else. 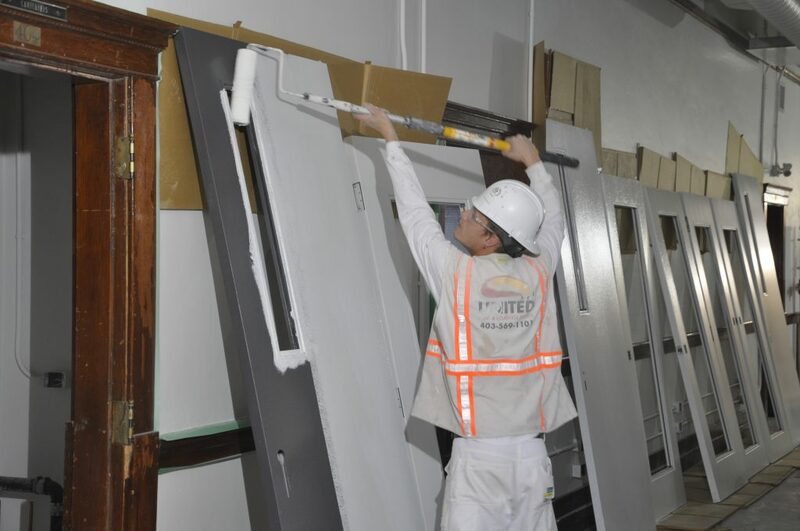 With the installation of freshly painted modern doors alongside historic ones, the fresh paint has also enlivened the corridors with the intent for these spaces to be galleries and backdrops for art. Throughout September upper floors were masked and painted while painters moved to the second level tenant spaces and corridors in October. 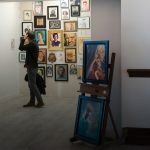 Where temporary art like the verse of Poet Laureate Kris Demeanor once graced the walls, we now see a white canvas appear leaving room for new artistic expressions to inspire. 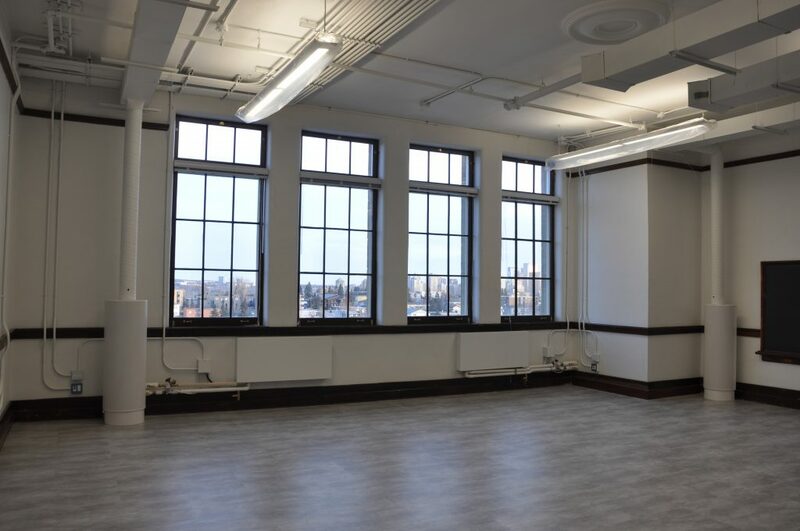 Slivers of character-rich brick are highlighted throughout the school adding a tactile experience to this historical space. With lighting instruments now hung in most tenant spaces, the murkiness of construction lights has been replaced with even illumination from direct-indirect LED fixtures. 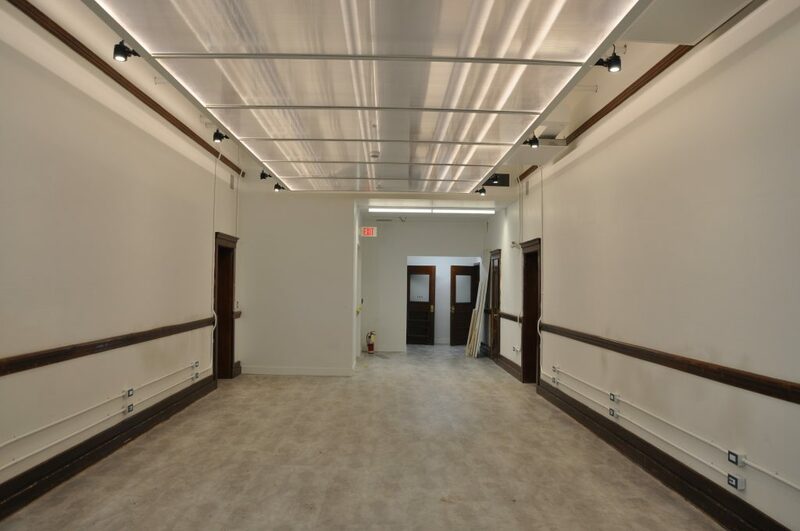 The hallways have been outfitted with ceiling “cloud” transparent polycarbonate panels and flexible gallery lighting to ensure the hallway gallery spaces become the perfect backdrops for shows, exhibitions and sales. 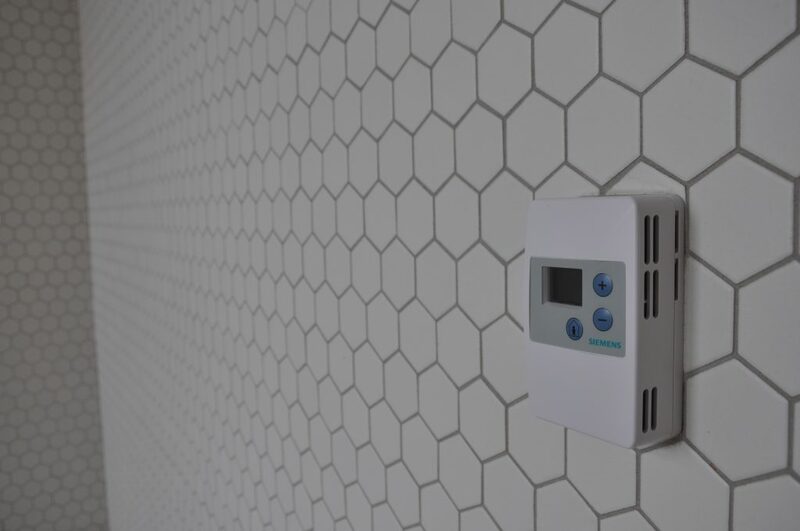 We are happy that these will help us maintain our sustainability objectives while delivering a pleasant work environment through occupant sensor control, photo cells and dimmers that allow for maximum flexibility. 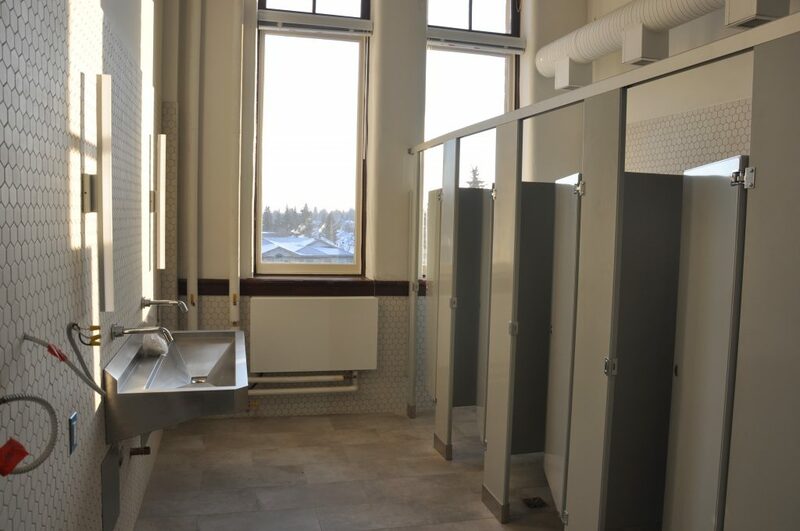 Washroom fixtures have now been installed throughout the facility, which was a pretty vital part of preparing for occupancy! In an architectural nod to the historic porcelain tiles of the main entry, the tiles selected for the washrooms add timeless detail to these new spaces. 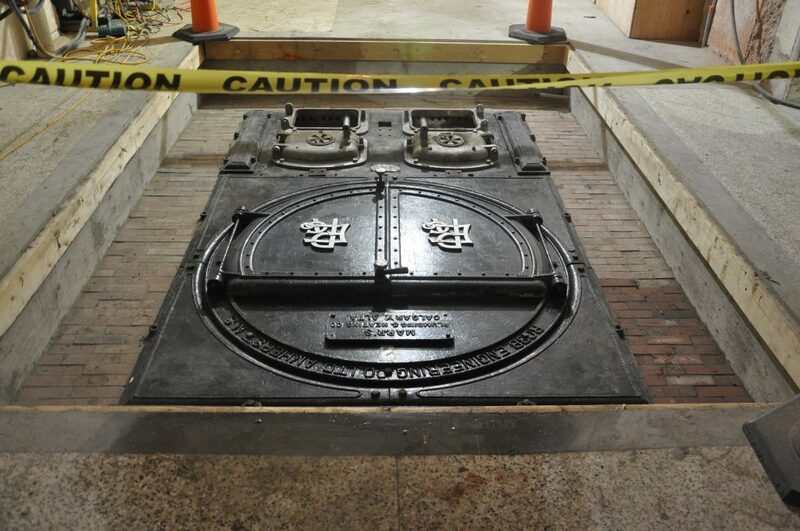 Now set into pits cut into the original terrazzo floor, we are even more excited that our effort to retain historic boilers from days-gone-by will have a rich effect. These unforgettable cast-iron artifacts have been carefully cleaned and set upon a bed of historic bricks for their ongoing preservation. 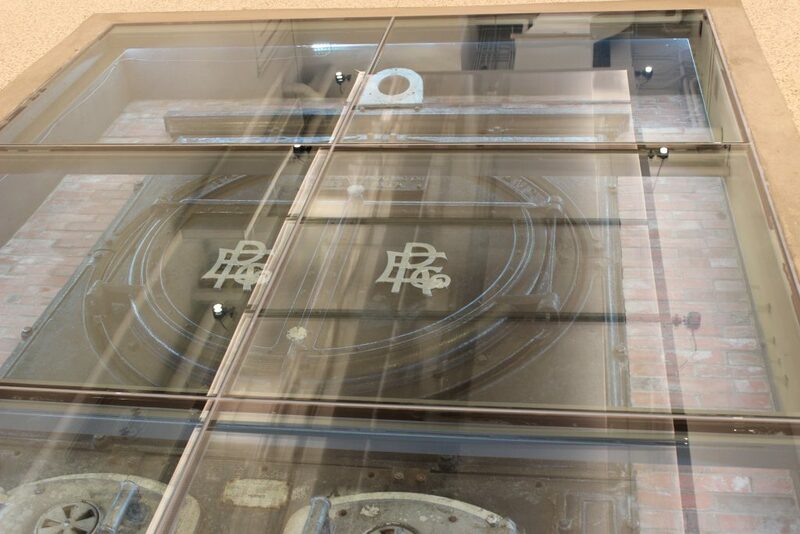 With a final topping of structural glass and specialty lighting, these features will be a showcase for the many community events that our boiler floor lobby space will support. 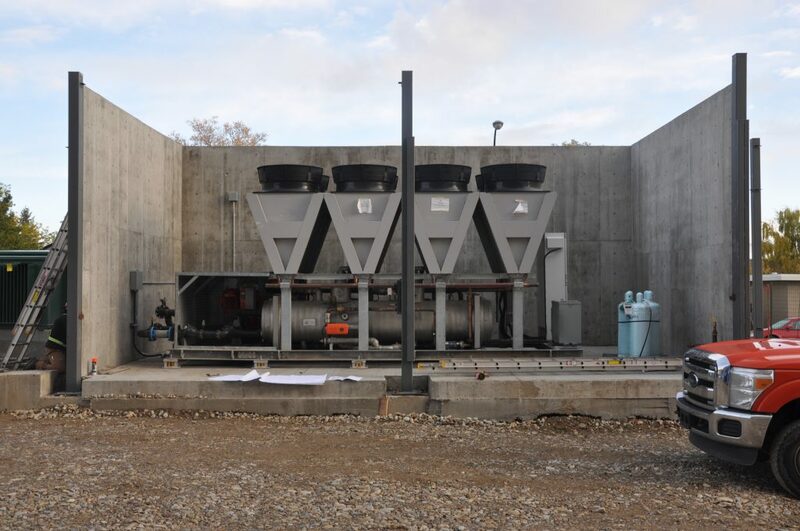 As temperatures dropped with the promise of winter for our prairie locale – we are all the more pleased that our new high-efficiency boilers are now firing on all cylinders! With heat now radiating through fan-coil heating units providing comfortable places for creativity, the small plum of exhaust from our reconstructed historic chimney is also a welcome sight. With the tenants now moved in and calling cSPACE King Edward home, it’s a great feeling to see the “home fires burning” for the community’s return to a revitalized King Edward!